It’s a new year, and many of us are dreaming of future RV trips. Some of us also may be considering healthy RVing tips, including healthy snacks to pack for a road trip. As for me, it’s not a typical January in our household. Weather-wise in central Arizona, it’s been warmer than usual. You’d think all this great winter weather would have me exercising all day, every day, but who really does that?! Also, we aren’t running a half marathon, like we normally do in January. I’m running a 10k, and Mark has been relegated to “cheerleader” due to a knee issue. My running is lighter this year compared to years past. A girl needs her snacks — preferably the ones that crunch. 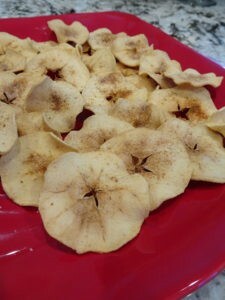 These apple chips fit the bill perfectly. They are an all-natural, crunchy snack that will become a family favorite. I like to use Granny Smith apples, but I think Honey Crisp would be great, too. For me, there is just something about the tart/sweet combo of the Granny Smith that keeps me coming back for more. Really, any firm apple will do. I don’t think Red Delicious would hold up, but let me know below in the comments if they work for you. This recipe is flexible, so feel free to use more than one kind of apple; you could get a flavor variety in the box when snacking. This is also an RV-friendly recipe! The recipe calls for the oven to be on for a long time; you may want to be plugged into electricity and bake in smaller batches if you give this a try. The micro-convection RV oven will work for this recipe the same as a regular oven at home. If you have a gas RV oven and it runs hot like mine, lower the temp and keep an eye on it the first time until you zero in on what temperature works best for your oven. You only need three ingredients: apples, cinnamon, and sugar. Set the oven to 200 degrees. 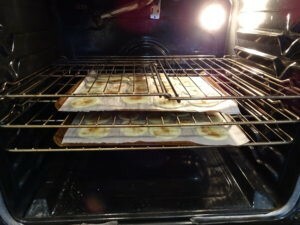 I’ve tried it at 170 (the lowest my oven will go) and it took way too long. I tried it at 225 and, while crunchy, they still weren’t right. For my oven, 200 is perfect. 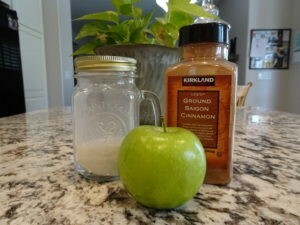 Stir some cinnamon and sugar in a small dish for sprinkling on the apples. I stir a little of each. 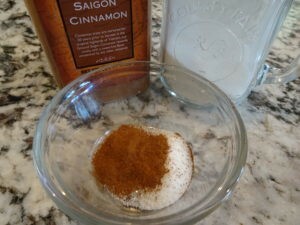 You can use just cinnamon if you’d like. If you’re looking for just apple flavor, you can even skip this step altogether. Now it’s time to peel your apples. It’s okay to leave the peel on, but I found the crunch is less and I definitely want crunch in my healthy RVing snack. Slice them as thin as you can using a sharp knife or mandolin slicer. A fancy spiralizer with the slicing attachment will work as well. 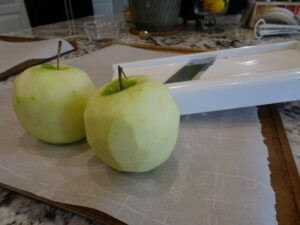 Place the apples on a parchment paper-lined baking sheet and sprinkle the cinnamon/sugar mixture on top. Then bake for 1.5 hours. 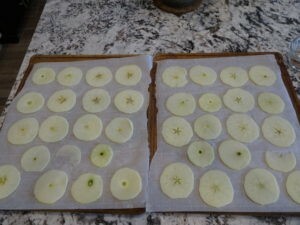 I place roughly one apple per baking sheet. 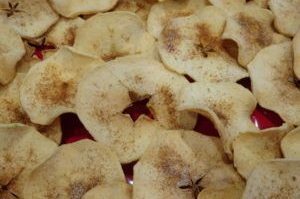 Remove the pans from the oven, turn over the apples, and sprinkle the cinnamon/sugar mixture on this side. Bake for one more hour. Because I want a good crunch, I turn the oven off and let them sit in there for another hour or so. You can store them in a Ziploc bag or an airtight container for a week — if they last that long! Let me know how yours turned out in the comments below. You can print this recipe here!